Toxoplasmosis is a disease caused by a parasite (called toxoplasma gondii) and is common in nearly all warm-blooded animals. However, it is considered rare for the disease to cause serious clinical symptoms; and when it does, diagnosis is difficult. The most common cause of toxoplasmosis in cats is the consumption of infected raw meat (given to them by their owners, or scavenged from bins), and prey animals such as field mice which they catch whilst hunting. The cat is the only definitive host for the parasite which, having been ingested, then produces its eggs (oocysts), and multiplies in the small intestine. This phase is known as the neuroepithelial cycle. The oocysts are then, in the vast majority of cases, excreted in the cat’s faeces. However, in some instances, the parasites penetrate deeply into the wall of the intestine, multiply, and then spread to other parts of the cat’s body. This less common phase is known as the extra-intestinal cycle, and those infected can become chronically ill from the formation of tissue cysts as a result. This is how toxoplasmosis, the clinical disease, occurs. It is the non-specific signs of clinical toxoplasmosis which have stimulated Feline Friends to write this paper. We are concerned that the disease all too frequently goes undiagnosed. The most common symptoms are lethargy, lack of appetite, and fever. Because the standard blood tests taken do not show toxoplasmosis, lethargy and lack of appetite can easily be mistaken for the existence of psychological problems – such as those which can accompany environmental changes, or the loss of a human or feline friend. When the disease worsens, other symptoms can occur depending upon the location of the infection. Vomiting, diarrhoea, respiratory distress and problems with the central nervous system are some of them. Eyes can also be affected, with inflammation and enlarged pupil size. 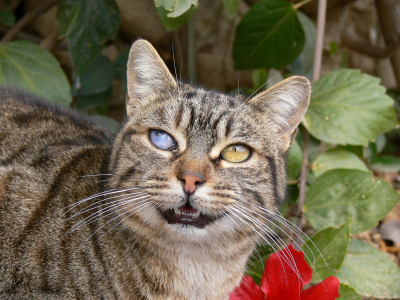 In two cases known to Feline Friends, the third eyelids started to cover the eyes. Diagnosis of clinical toxoplasmosis is difficult and requires specific blood tests by a laboratory. Even then the science has yet to be perfected. A “presumed” diagnosis can be made by measuring the antibodies to toxoplasmosis in the blood. There are two: the IgM and the IgG. A high IgG count suggests that a cat has been previously infected but is probably now immune. A high or rising IgM count suggests that there is an existing clinical infection. Currently, it is only the positive response to treatment that assists this diagnosis. Antibiotics are the only treatment currently used, and most cats recover from clinical toxoplasmosis when a complete course is given. Clindamycin is the most commonly prescribed antibiotic. Whilst it will not eliminate dormant cysts, it is effective against the active forms. No vaccines are yet available. Can humans be infected by toxoplasmosis? 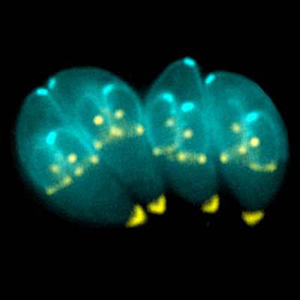 Exposure to toxoplasma is very common, but the vast majority of us have adequate antibodies to the organism. Just as with cats, eating raw meat is a typical source. Unwashed vegetables, fruits or salads are some of many other sources of toxoplasma, as are ewes at lambing time. The greatest danger is to pregnant women who are exposed to the parasite during pregnancy and pass it to the unborn child. It is unlikely that exposure to an infected cat would result in transference of the disease. The parasite is not carried on the cat’s fur, so stroking a cat is also unlikely to cause such an infection. Direct contact with contaminated soil, rodents, sheep, unpasteurized dairy products, and cat faeces, are some of the most common causes of toxoplasmosis. Does Feline Friends have a recommendation? Due to the apparent rarity of the disease, and the fact that toxoplasmosis does not show up on the normal haematology and chemistry blood tests, cat owners and veterinary surgeons should always be aware that this parasite is lurking in our environment. If your cat is showing signs of lethargy, inactivity, and loss of appetite, and has recently been fed on raw meat, or has brought you “presents” from the fields, then mention this to your vet so that he/she can recommend a toxoplasma blood test if he/she thinks it appropriate.